I'm sometimes asked whether my materials are suitable for learners with intellectual disabilities, and whether they can learn to read and spell. Many learners with severe and profound intellectual disabilities don't understand much spoken language, and have little or no speech, so teaching them face-to-face communication, social, self-care and other skills are their families' highest priorities, and what ends up on their individualised learning plan. However, I know learners with measured IQ scores in the 40s who have learnt to read and write simple texts (though I'm not sure their IQ scores were accurate), and there's no reason to think that someone with an IQ of 60 or more can't learn to read and write at least at a basic level. What's the difference between someone with an intellectual disability and a slow learner? The imaginary average IQ is 100, but of course the same person might score 105 on a good day and 95 on a bad day, so someone with scores between 85 and 115 is considered to have average intelligence. An IQ below 70 is considered to indicate intellectual disability, but there are many children with IQ scores between 71 and 84 who learn more slowly than their classmates, despite no formal diagnosis, and thus no eligibility for extra support at school. Learning depends on the learner, the program and the teacher. Learners with similar cognitive skills can achieve at very different levels. Attention control and motivation are important – one teenager with an intellectual disability I worked with was desperate to read, and used to ask at the start of every session "Can we do reading?". He'd read our decodable books nonstop all lesson if myself and his integration aide didn't insist he do some writing/spelling and wordbuilding as well. Learners with low IQs need an intensive, explicit, systematic program with tiny steps, and a skilled and persistent team. They take longer to learn than mainstream learners, sometimes a lot longer, so it's important to be able to measure and celebrate small gains. The journal "Exceptional Children" recently published an interesting article on this topic, called "Is scientifically-based reading instruction effective for students with below-average IQs?". The whole article is available online, via this website. I've been ploughing through it with my highlighter pen and a furrowed brow at the statistics, occasionally shouting "Yes!" (it's OK, nobody else is in my end of the building today), because like here in Australia, many learners with low IQs in the US finish school with few literacy skills, and this doesn't get enough attention as a serious problem. Like here, a lot of literacy research in the US excludes children with intellectual disabilities or children with low nonverbal IQs, and literacy programs for them often focus narrowly on training sight-word reading and letter-sound correspondences, and not much more. 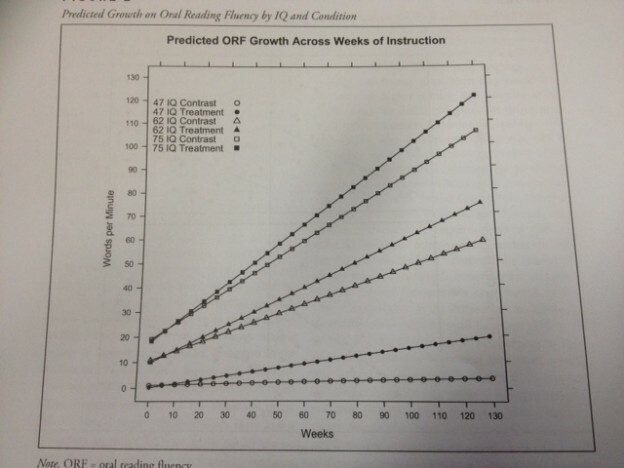 This research took four years and studied 141 students with IQs from 40 to 80, with just over half doing a program called Early Interventions in Reading, and the other half doing a variety of programs chosen by their schools. Sometimes these were explicit, systematic programs like Corrective Reading, and sometimes they were not. Research done over years in schools can be pretty messy, because a lot of factors can vary over time e.g. children changing schools and schools changing what they teach to the kids in the comparison group, but in general on most measures the learners doing the explicit, systematic program performed better than the comparison group. Progress was slower than for mainstream learners, and some learners really struggled with blending. The authors conclude that their research provides "a clear demonstration of the potential of students with low IQs to achieve meaningful literacy goals and a clear demonstration of the persistence and intensity it takes to help children with low IQs to learn to read." Shouting "Yes" to that, and putting the new little kid with a low IQ score on my list into as many literacy groups as possible. This entry was posted in curricula, research on July 15, 2014 by alison. Thank you , you have given me some hope..my little 51/2 year old granddaughter has a partial deletion of the 8th chromosome. Last month her IQ was measured at 47. Her parents (both Lawyers – not that that means anything) are full of grief. Esperance also has a palliative heart condition. The doctor said “even a dog has an IQ of 60”. I refuse to accept this. Esperance can sing and hum a melody perfectly even though her words are difficult to understand, even tunes she has not heard for months. Four days ago we were walking past a large retail shop that had a billboard advertising brands of toys. Words only – no pictures.eg We stock Tonka Matell Disney Shopkins etc. Esperance pointed and said “I want that” I said “what do you want” and she said “SHOPKINS” – I almost collapsed with shock. She can count to six. She cannot repeat the Alphabet past ABC. She cannot hold a pencil and has very poor muscle control. She is sweet, kind hearted and has a sense of humour. Two days ago I made 3 flash cards – doll, baby and Ezzie ( her name). No pictures on these cards. I played “hide the cards” and “Find me – doll” it is slow but she is getting the idea. Perhaps I am wasting my time. She is enrolled in Prep at a Special School for 2017. She is bowel and bladder incontinent. Does music come from the same brain area as reading? if one can memorize a tune, then why not words. I realise that she may never be able to work words out with phonics and X+y may be beyond her , but it would be great if she could read a simple cookery book or story one day. I have a 10 year old with a mild intellectual disability diagnosis, with an IQ of 67. He is reading at about a 2nd-early 3rd grade reading average. I’ve tried finding the answer ( or confirmation) to this question online and it’s just not out there, and maybe it’s because every child is different. I think the best type or genre of book for my son to be reading right now, if at all possible, are non-fiction books. He just doesn’t understand any type of fantasy, action, or mystery, and he doesn’t even really get simple humor. I know he gets humor in other areas however so I don’t know if he is concentrating so much, or just going thru the motions during reading that he doesn’t pay attention enough to understand the joke. He is very black and white and I am more than willing to help read with him every night but I want him to bring home books that he will understand the best, be able to read the best, enjpy the most (I love to read so I want him too as well) and get the maximum amount of learning out of our time. Do you agree with the non-fiction type, or is it always going to be super specific to each child? I’m trying to convince his teachers I know what I’m talking about, but I didn’t come up with this theory until end of summer so I don’t have much background to stand on yet. I was just curious if anyone has ever asked you what type of books children with ID tend to read the best or enjoy the most. PS I should have also said that fiction is one of the ways that we all learn to appreciate other people’s perspectives and worlds, and can be a useful tool in teaching about these, but the information that the socially typical person can extract from the subtext of a story often has to be made explicit to learners who are socially less typical (i.e. explain what’s going on in the characters’ heads, don’t assume this will be understood).